This is a tale of many goggles. I'm still figuring out swimming technique and methods, but I have learned a few things about gear. Goggle are essentially, especially if you need glasses or contacts like I do. In a perfect world, I wouldn't need either of these things to finish laps, but I'm still at the point where I need to count the minutes I have left to survive in these workouts. First, I tried Swedish goggles, which are at the top of this picture. I picked these because of the price point and the fact that they are fully customizable ... in theory. In practice, even after watching this YouTube video, I still ended up with two pairs of goggles that leaked all over the place. Every attempted flip turn ended with a face full of chlorinated water. I couldn't complete more than a pool length or two without stopping to gasp, sputter, die adjust my goggles. These also didn't have any padded sealing things around the goggles, leaving me with raccoon eyes when I was done. Hot look. Next, I annexed a pair of goggles Tim acquired. Long story short, they didn't help. They were too big for my face and weren't easily adjustable. So I bit the bullet and bought another set of goggles, which are at the bottom of this photo. This time, I did research on Amazon and Pinterest before deciding to purchase a set of Speedo Vanquishers, which were made for women. I went with this color combo just because it was the cheapest available. For $13, I got a set of goggles that made all the difference in the world. While these still fog up, they don't leak, protecting my contact lenses and allowing me to complete a flip turn without the goggles flying off my face. It's not perfect, but it makes a world of difference having the right gear. Read the product descriptions closely. Are you looking for racing goggles, mask-style goggles or Swedish goggles? Check out the reviews. A lot of people have spent serious time sharing their thoughts on these products. Ask someone at the gym what they're using. Most people are more than happy to wax poetic about all their doodads and gadgets. Search on Pinterest for triathlon or swimming gear. There are some great users creating detailed boards about what they use. Next on my list of triathlon gear to figure out: bike bags. Any thoughts? Hmmm, I bought my goggles at Marshalls. I think they're Speedo brand? Anyway, I have to cinch them so tight on my head they still leave raccoon eyes even with the padding. Is that just a side effect of swimming or are there really goggles out there that don't do that? 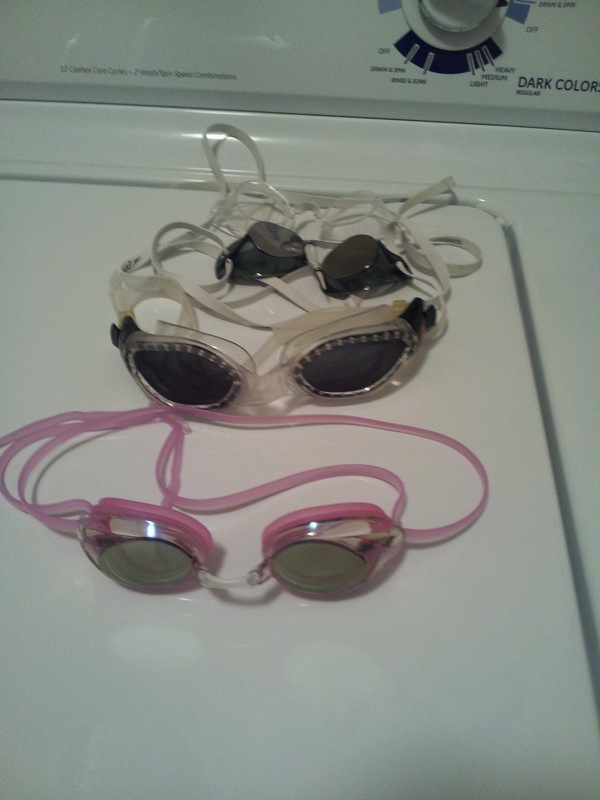 I think the Speedo ones still probably give me some circles around the eyes, but it's gone by the time I get to work.